Sweet. Savoury. Mooncake. Pie. Well, Chef Lo Tian Sion’s newest baby is all these and more. Taking his cue from a street snack he chanced upon in Taiwan, he has twisted and turned the humble scallion pancake into his newest mooncake creation, Shanghai-style Baked Black Pepper Smoked Duck Meat With Yam. And I'm going to call it the "MOONPIE". This savoury mooncake comes with one special condition: It’s for dine-in customers only. When asked why, Chef Lo explains that the best (and only) way to truly relish this mooncake is to eat it hot off the oven. “If customers take it home, the taste and texture may no longer be pristine,” he says. 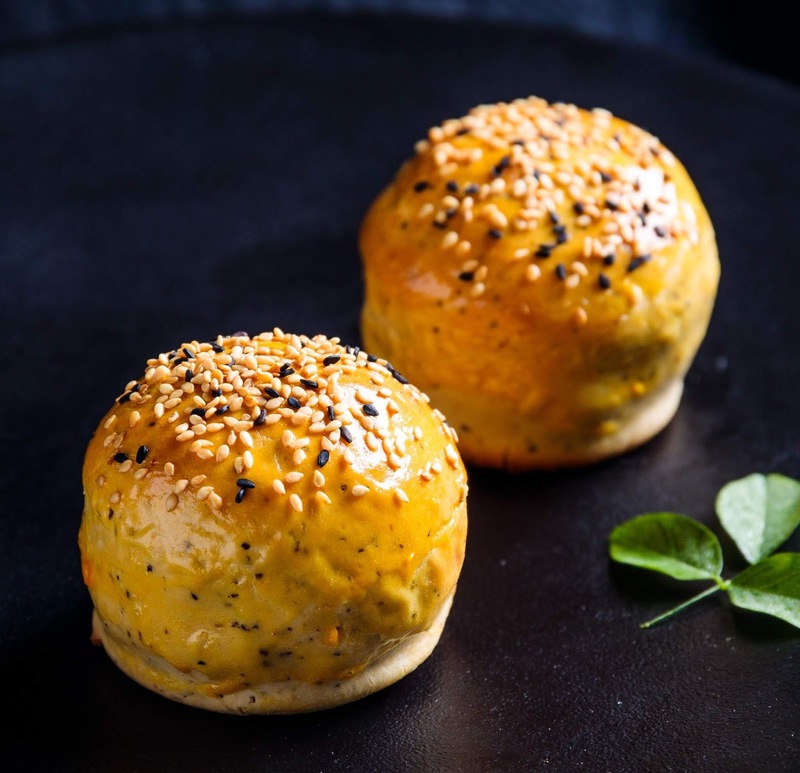 At first glance, Shanghai-style Baked Black Pepper Smoked Duck Meat With Yam (RM43) looks like a regular Shanghai shortcrust pastry mooncake, baked to a glaced golden brown with white and black sesame seeds sprinkled on top. But cut it open and immediately, we are enveloped by the aroma of smoked duck and black pepper with hints of scallion. The taste is rather exquisite. The smooth, creamy texture of the yam paste contrasts well with that of the smoked duck and you get short bursts of heat from the crushed black pepper. But this is not all from Chef Lo this year. While traditional mooncake flavours are retained, he offers a few new items, such as Marble Snow Skin With Butterfly Pea Flower & Bird’s Nest (RM43) and Snowskin With Japanese Green Tea & Cherry Jelly (RM31) which, surprisingly, captures the hearts of both children and adults at the table. The cherry jam heart is made in-house with Australian cherries. The slightly tart taste dances so well with the green tea lotus paste that we reach out for a second slice. Durian mooncakes are always a hot item at Tao Cuisine and this year, it offers Durian Paste & Oats (RM43). Chef Lo combines D24 durian flesh with oats for a healthier take. 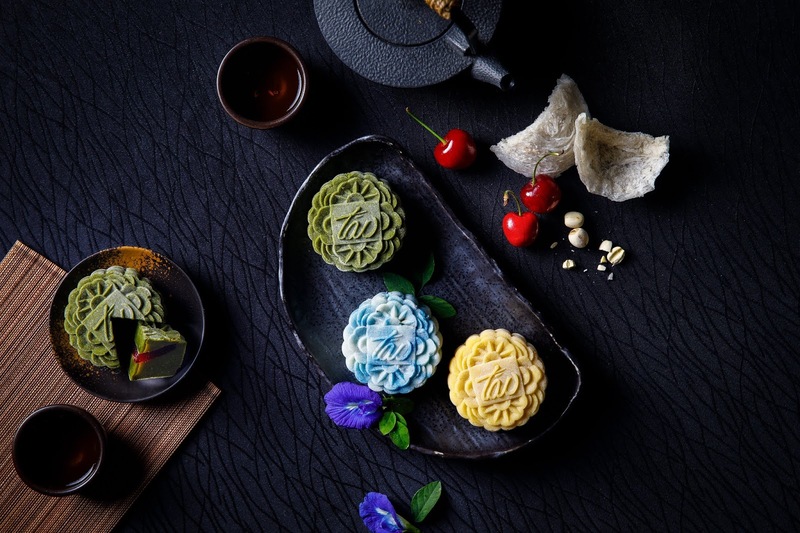 Apart from traditional lotus paste, red bean paste and mixed nuts, baked mooncakes come with fillings of pandan as well as black sesame and bamboo charcoal. The gift box, for purchases of 4 mooncakes, is a pretty red and black design with peach blossoms embossed in gold.